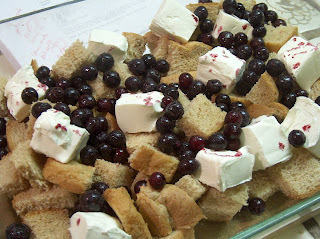 Among many, many other blessings, I am thankful for my mom's awesome cranberries (two kinds! 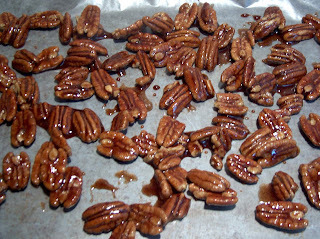 ), my friend Pam's make-ahead gravy (love that gravy), and, of course, pecan fudge pie (recipe, pg. 255, Queen of the Castle). 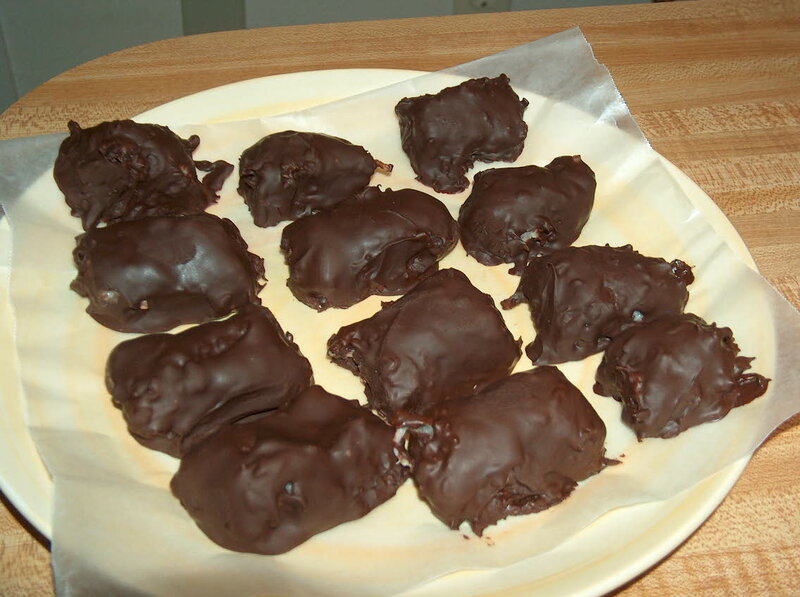 If you have extra mashed potatoes lurking in your fridge (see this post for a shining example), you will be overjoyed to learn of this recipe: chocolate-coconut potato candy. 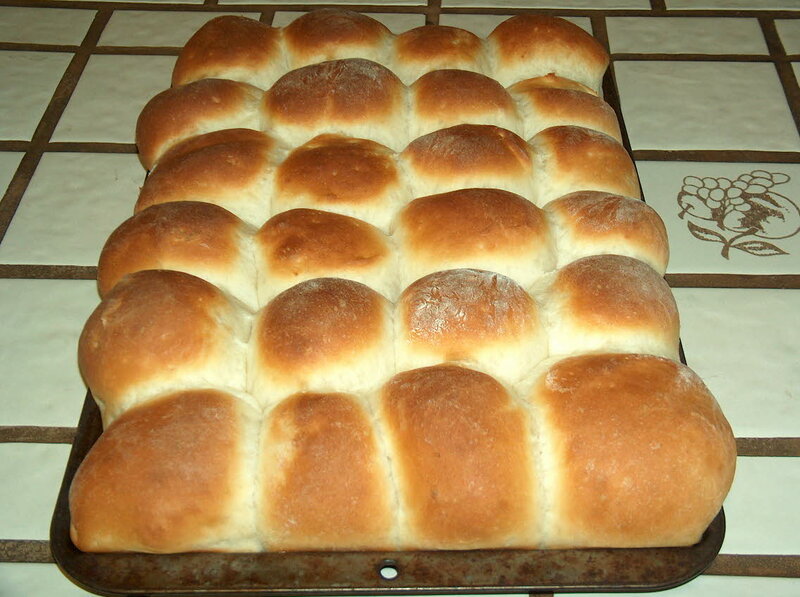 You might also want to look into these delicious, light as air potato rolls. Now go. Eat. Be filled with thankfulness. And if you get a chance to go see the movie The Blind Side? Go do it. Awesome. This is the first recipe I've ever tried from famed British food writer, Elizabeth David. 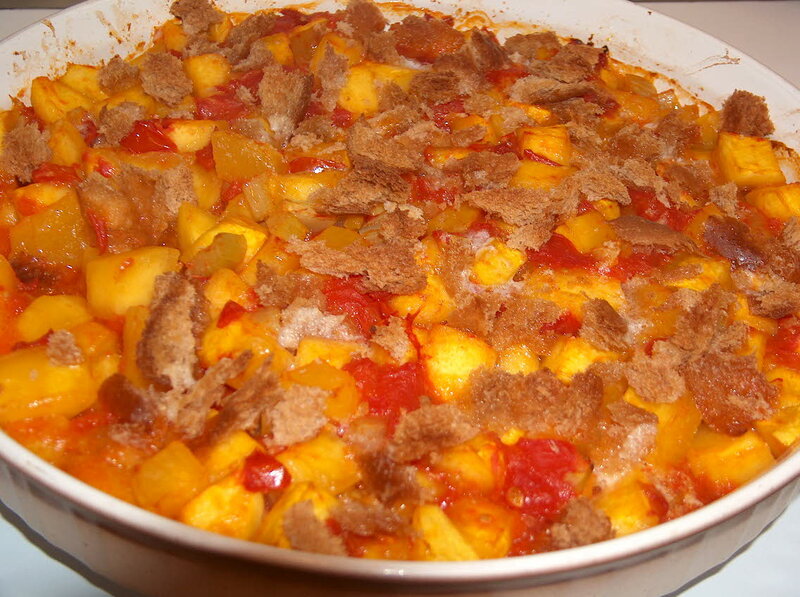 It's a very colorful, tasty vegetarian dish, one I was especially happy to come across as I still have a pile of pumpkins and a constantly full windowsill of ripening tomatoes, smiling at me whenever I pass through the kitchen. And just look at these colors. Aren't they beautiful? I'm not gonna lie, this dish takes a bit of time to prepare -- you have to peel and chop pumpkins, chop and sautee tomatoes, put it all together and bake for 35 or 40 minutes. But it is tasty and filling, with the dominant flavor being tomato. I think it would make a lovely Thanksgiving side dish, if you're looking for an extra one and have the time. I made a few minor changes -- omitting parsley, for example, and cutting down the salt a bit -- so I'll write it here the way I made it. The recipe comes from the book Elizabeth David's Christmas, edited by Jill Norman, compiled from Elizabeth David's notes after her 1992 death. Peel pumpkin and chop into small chunks, discarding seeds and gummy stuff in the middle. In large, heavy frying pan, melt butter over medium heat. Add pumpkin, celery, and salt. Cook gently, uncovered, until pumpkin is soft. (This took maybe 20-30 minutes? I kept spearing the little pumpkin cubes and tasting until it seemed suitably soft. At this point the dish is pretty salty, but don't worry; it all works out in the end.) In Elizabeth's words, the pumpkin should be "just beginning to look slightly jammy." Remove from heat and place pumpkin in shallow gratin dish. 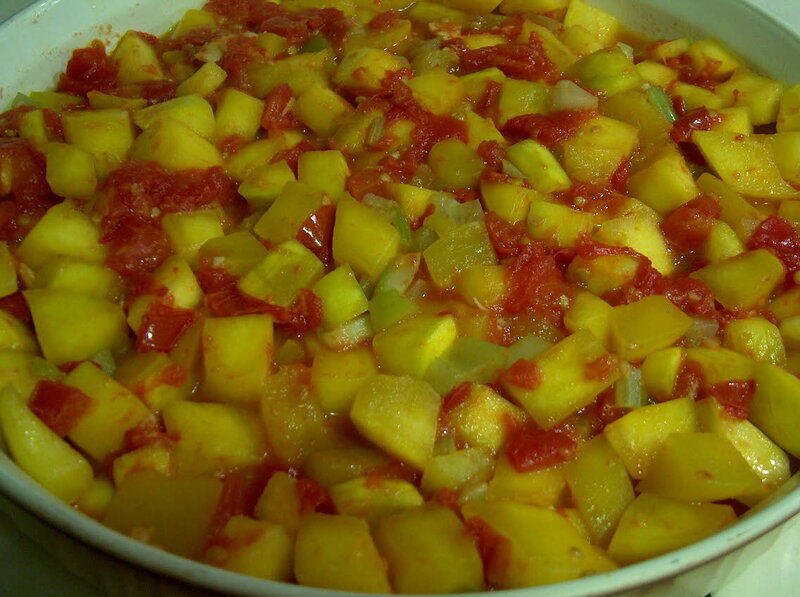 In the same pan, cook the garlic and tomatoes at medium-high heat until most of the liquid cooks off. ("The tomatoes are almost in a puree," says Elizabeth -- this took maybe 20 minutes or so.) Remove from heat, mix in with the pumpkin, and smush down the veggies till they're flat. 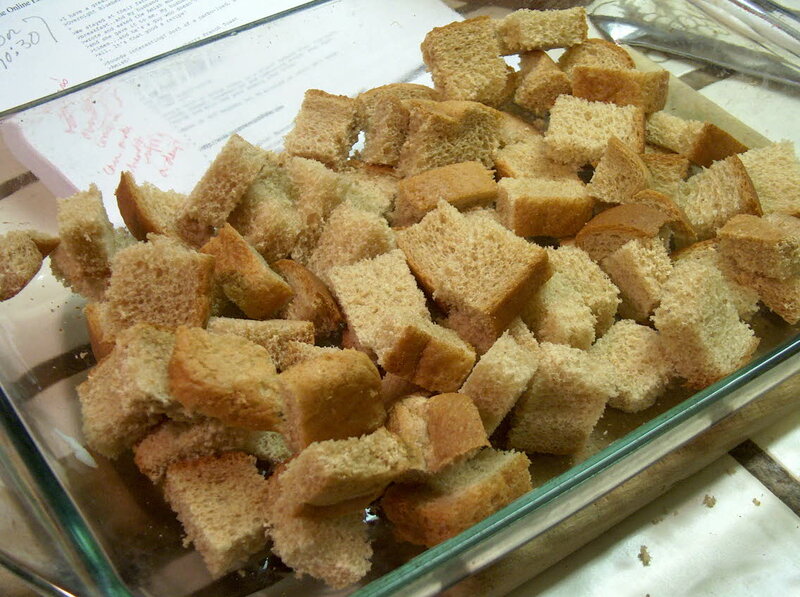 Top off the dish with the torn bread pieces and the remaining T. of butter, cut into little blobs. Bake in top third of the oven, at 350 degrees for 35-40 minutes, until golden. If you're a scone lover, you have to give these babies a try. They're made with heavy cream and lemon extract and dried cranberries. And they are good. Oh so good. The recipe comes from a fun book I'm about a third of the way through: Confections of a Closet Master Baker, a memoir (with recipes) by Gesine Bullock-Prado. You can see her blog here. The author happens to be the sister of actress Sandra Bullock. But more importantly, she's a wonderful baker. She left Hollywood and a job at her sister's production company to start up her own bakery in Vermont. And I, for one, am glad she did. Because if she hadn't, I wouldn't have this scone recipe. And I'm reeeeeally glad I have this scone recipe. 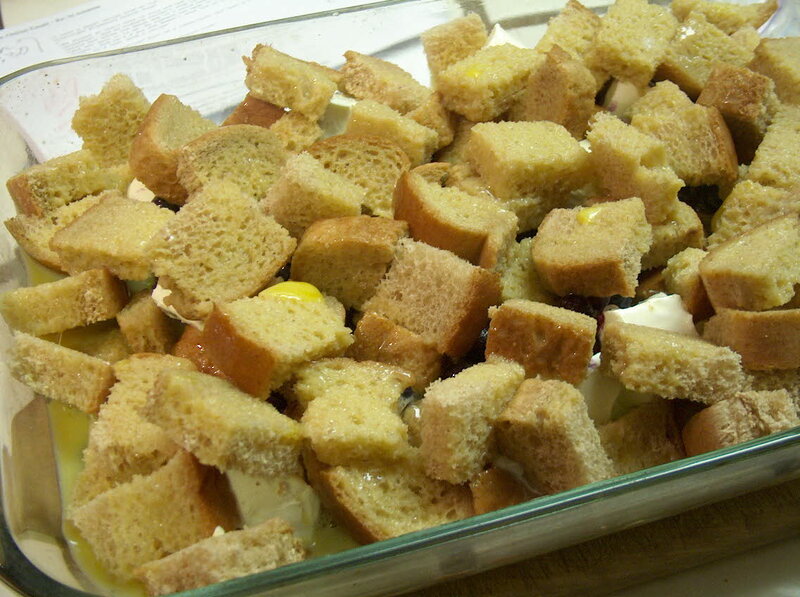 In small bowl, combine cream, egg, lemon extract, and 3 T. sugar. Set aside. 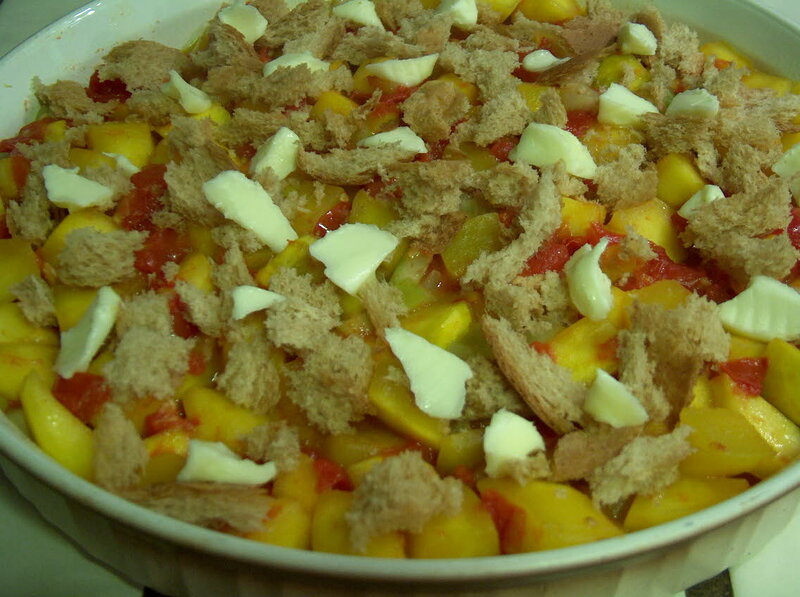 In large bowl, combine flour, salt, and baking powder. Drop the butter into the flour mixture and use your fingers (I used a pastry blender) to work in the butter, until your mixtures is the texture of coarse meal. 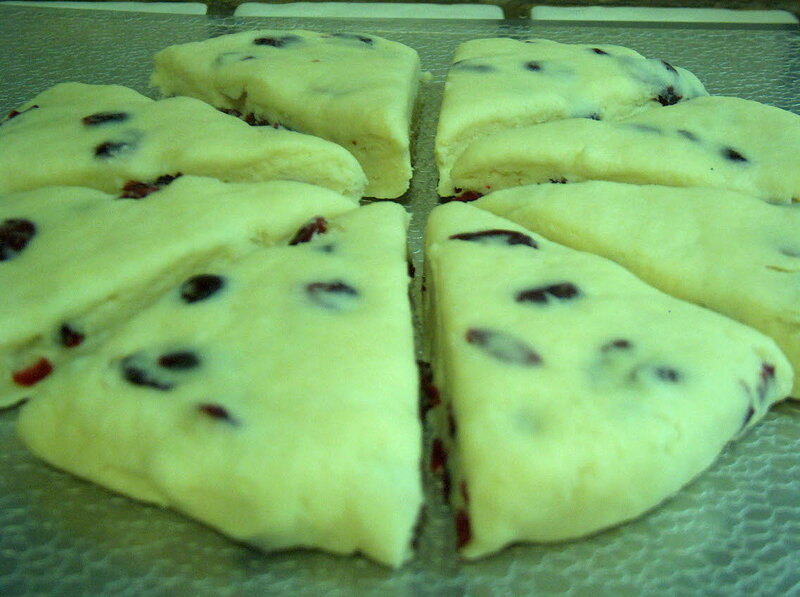 Stir in the cream mixture and the cranberries with a fork, stirring only until a sticky dough will hold together. Knead gently for about 30 seconds on a floured surface. Pat into a 1/2-inch thick circle. At this point, the author uses a 1 1/2-inch fluted cutter to make scones. I decided to cut mine into wedges instead. 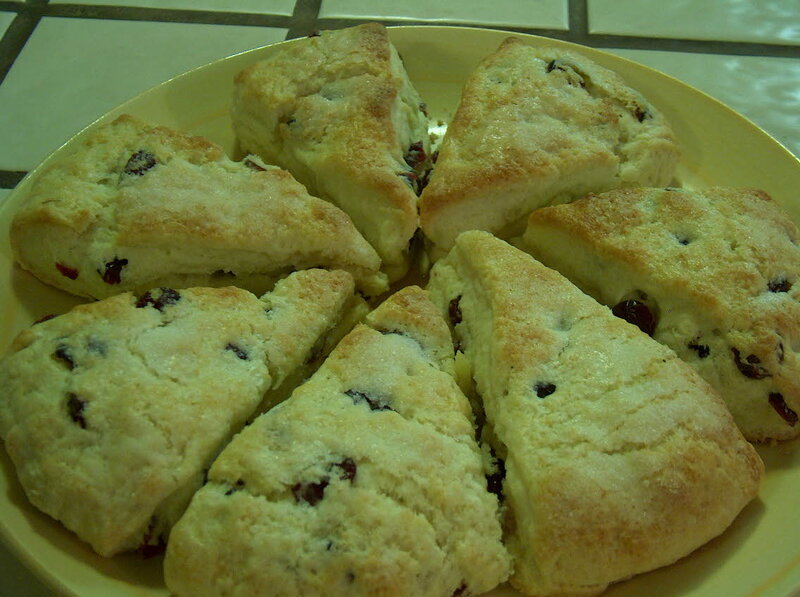 Place scones on ungreased baking sheet. Brush with cream, then sprinkle with sugar. 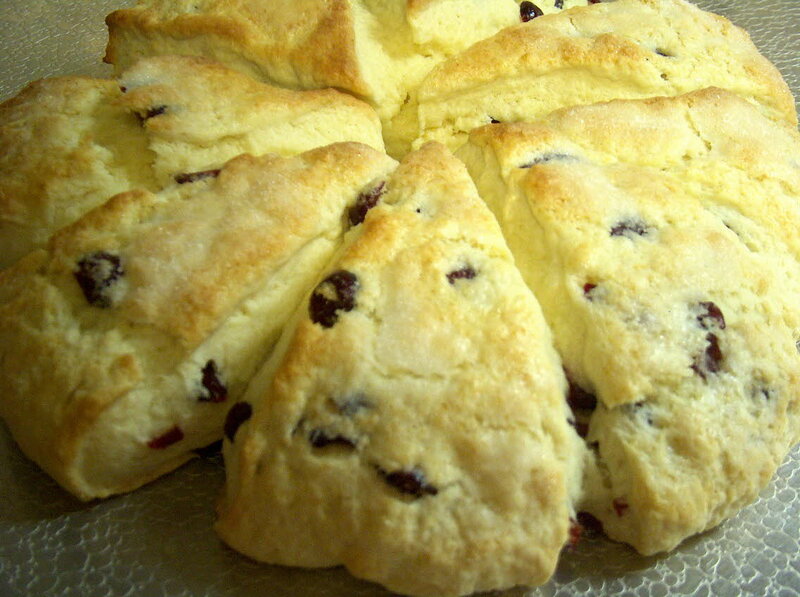 Now the question of the day: Do you have a favorite kind of scone? And what do you think: glaze or no glaze? You've probably never seen an overnight French toast recipe quite like this one. 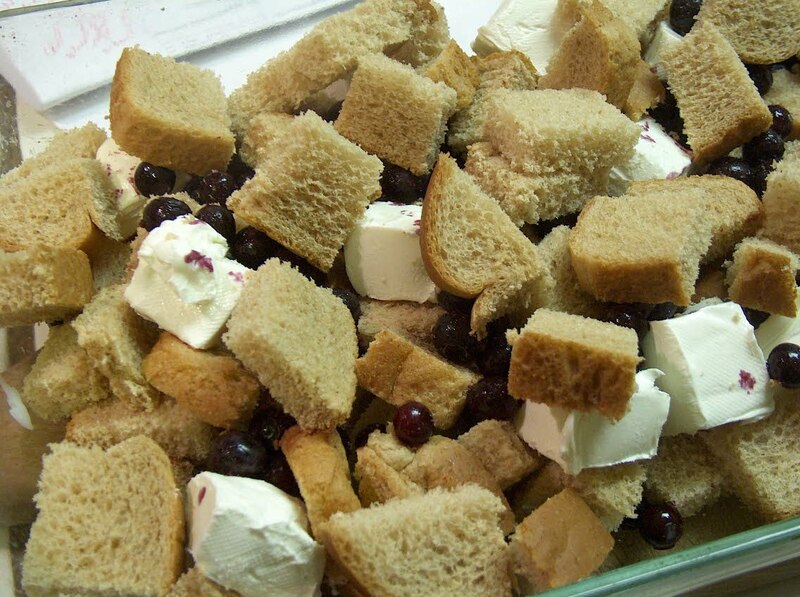 In addition to the expected eggs and milk and bread cubes, it contains the added surprise of luscious blueberries, maple syrup, and cream cheese chunks. Sound like a special holiday breakfast you might want to try? The recipe comes from Suzanne Woods Fisher, author of a number of books, both fiction and non-fiction, many of which have an Amish theme. Amish Peace: Simple Wisdom for a Complicated World. Suzanne's first book in her Amish fiction series, The Choice, will be released in January. 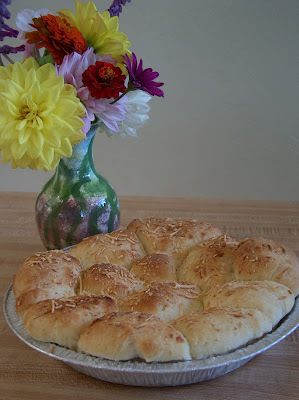 This recipe, says Suzanne, comes from an Old Order Amish family. "We stayed at their farm in July and had this for breakfast . . . and my husband couldn't stop talking about it. I wrote and asked the Amish mom if I could have the recipe and she gave it to me. My husband has made it a number of times . . . and he's a guy who doesn't know how to cook. Not at all. It's that good a recipe!" 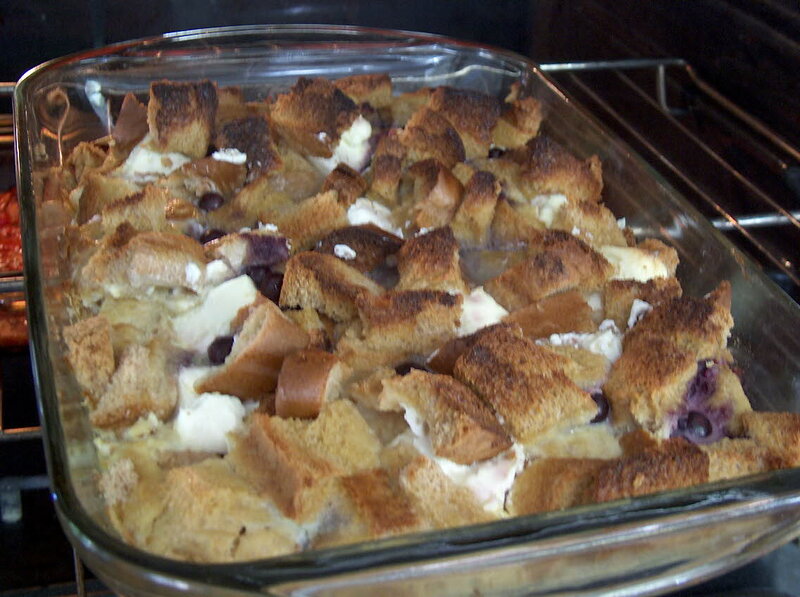 Here, then, is Anna's Overnight Blueberry French Toast. Brought to you via Suzanne; via me; via blogger. Aaaah, the wonders of the internet. 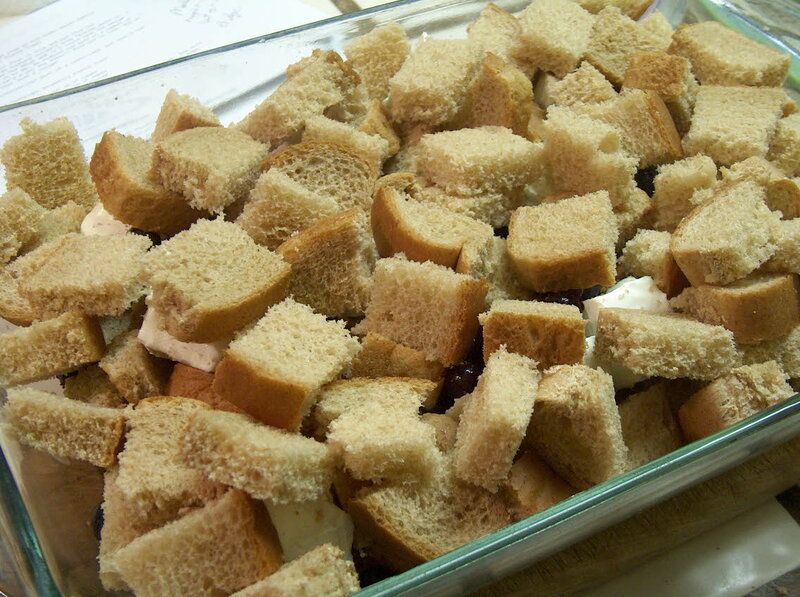 The night before, place half of bread cubes in a greased 9 x 13-inch baking dish. 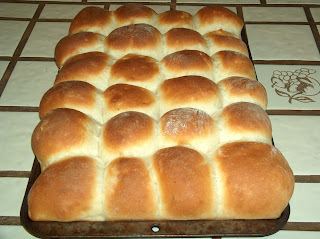 and pour evenly over bread. Put in the refrigerator. The next morning, bake at 350 degrees for 30 minutes or until well done. Serves six. 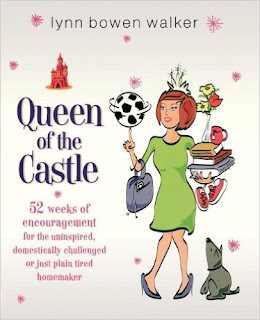 I have a guest post today from Susan R. Blaske Williams, author of Making It Home and publisher of Making It Home Magazine. Susan provides tips for sending care packages to those you love, and even those you haven't met yet. There are so many things we can do to share some joy and Christmas cheer with others -- even those living far away or stationed in the military. One of those things is to create and assemble a Christmas care package. Care packages can be sent to people we know, but they can also be sent to people we don't know through ministries and organizations who specialize in delivering care packages for special causes. Who are the people to consider? College students, active military personnel away from home, military families home and abroad, prisoners, orphans, missionaries, disaster victims, nursing home residents, hospitalized children, unwed mothers or those in a crisis pregnancy, single parent families, and special friends and relatives who may be living far away. How do I find mailing addresses for people I don't know? Conduct a search on the internet to look for ministries who distribute care packages to the specific people/groups you would like to reach, and speak to friends at church or in social clubs to ask for names of people who may like to receive a care package. Find out about the local organizations and ministries and ask about specific people you can help. Speak to the social worker at your school to locate a special family or child to bless. For military service men or disaster victims, include things like toothpaste, tooth brushes, hand sanitizer, personal wipes, mints and hard candies (avoid things that can melt), combs, soaps, shampoo, lotions, medicine packs (Tylenol, Advil, etc. ), vitamin packs, Band-Aids, disposable razors, ear swabs, nail clippers, magazines, crosswords or word puzzles, travel size games, pens, paper, envelopes, prepaid telephone calling cards, Bible, AA batteries, lighters. Liquid items should be in travel size bottles, and the bottles should be labeled if you are using generic bottles, especially for military personnel. For college students, consider non-perishable food items such as soup mixes, hot cocoa mix, microwave popcorn, a disposable camera, stationery, school supplies such as mini-staplers, notebook paper, calendar, organizers, calculator, etc. If you personally know the college student, you can include family photos, personal keepsakes and gifts, stuffed animals and gift certificates to their favorite restaurants or local grocery stores. Many prisons do not allow prisoners to receive packages, and those that do have a list of items that are accepted, for safety concerns. You will want to coordinate with a prison ministry to see what the rules for receiving care packages might be. Many prison ministries have pen-pal programs if you prefer this to sending a package. Many pro-life ministries accept care packages for unwed mothers or those in crisis pregnancies, and they also accept care packages for children. Things like blankets, diapers, teething rings, layette sets, bottles, diaper ointments and wipes are welcomed. You may also enjoy hosting a party and asking guests to contribute items to your care package --or to help assemble several care packages, including packaging and addressing them. What's not to love about a crockpot recipe that's easy and tasty and kid-friendly, too? This pork roast fills the bill nicely. No pesky little vegetables to scare off junior. The gravy comes from the apple juice the pork simmers in. 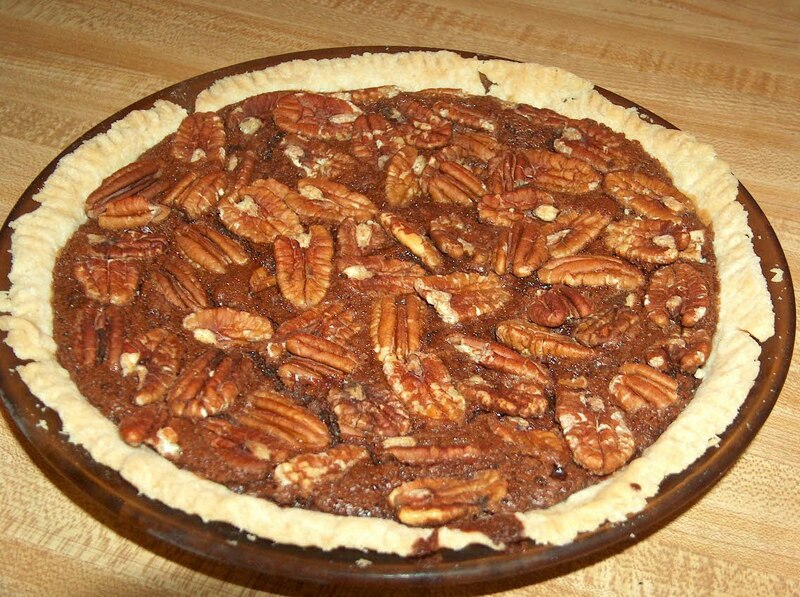 Next time I'm going to add a bit of salt, and make sure to serve this with mashed potatoes, or maybe baked-- something to sop up that delicious gravy. Spray your crockpot with non-stick cooking spray (or grease with butter). Add apple juice, sugar, soy sauce, vinegar, ginger, garlic powder, and pepper. Put roast in crockpot, and cook on low for 7-8 hours. When done, put in oven to keep warm. 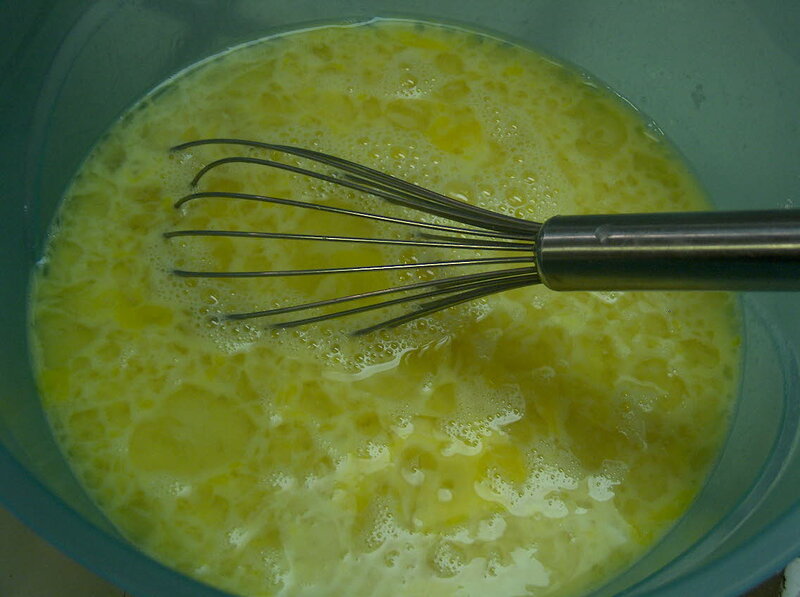 In saucepan, whisk together cornstarch and water until smooth. Add in juices from roast. Bring to boil. Cook and stir for two minutes. Add salt to taste. Recipe from Fix-It and Forget-It Cookbook: Feasting with your Slow Cooker. This serves only two, so make sure to multiply accordingly. It's a tasty little autumn treat that's quick to put together and will cost you 227 calories, according to my Weight Watchers Quick and Easy Menu Cookbook. Preheat oven to 375. 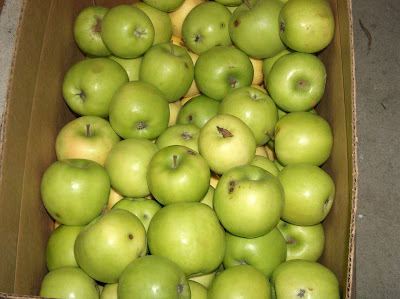 Toss apples with lemon juice and put in small baking dish. Add water, honey, and cinnamon, and mix well. 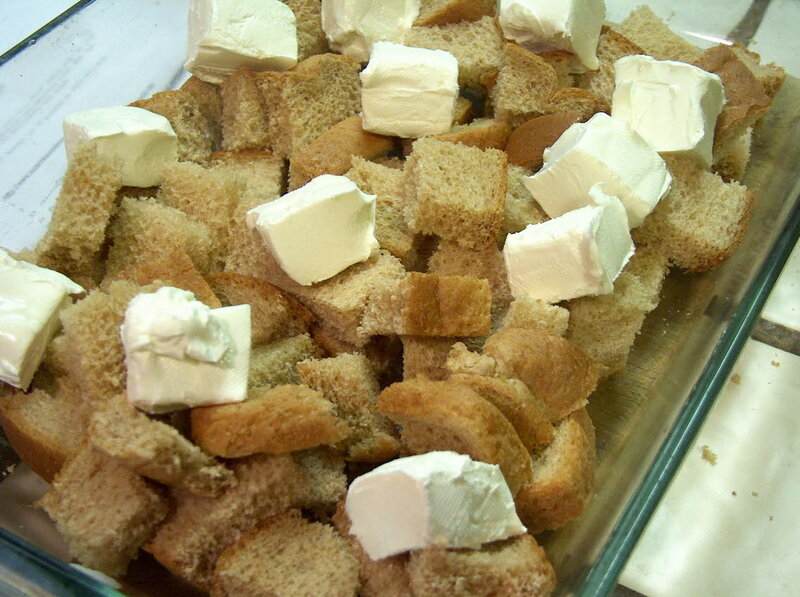 Dot the top with butter or margarine, and sprinkle over the crumbs. Bake about 30 minutes, until apples are soft. OK. Two down. A few more apples to go. What are some of your favorite ways to eat up those autumn apples? Think your kitchen's well stocked with the basic necessities? Go visit Molly's post, here, where she talks to me about my kitchen must-haves, and see if your Top Ten list matches mine. Molly and her husband blog about books, movies, and baseball, among other things, over at The Bumbles Blog. She also makes a mean spinach salad with maple vinaigrette. Check it out. And share with the rest of us your top kitchen must-haves. What are the items you feel no kitchen should be without? If you're looking for a tasty, healthy, full-of-fiber breakfast dish, seek no further. 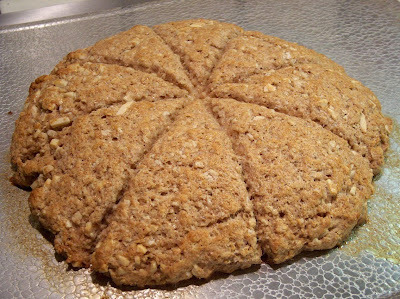 These almond-oatmeal scones, courtesy of Kari at the Eating Simply blog, are just the thing. I can only presume you could freeze them, but I really can't verify because I ate them all. They were gooooood.